Available ONLY on Rosemond.com! Want to hear the “best of” John Rosemond? Buy this CD! This CD was put in the bookstore because it was one of John’s most dynamic talks to date. You will not be disappointed! John gave two, 80-minute presentations to a crowd gathered in Sacramento, CA. 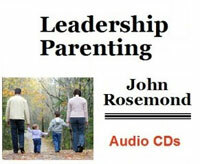 John focused on what he terms “Leadership Parenting” with emphasis on Effective Discipline. These entertaining and enlightening talks were recorded and are now available and are packaged in an attractive 2 CD set titled “Leadership Parenting Parts One and Two”.